Exchange OST Recovery tool allows the users to recover severely corrupted OST files and then exports OST into PST file format. The Software works with all the versions of Windows OS. Shoviv OST to PST Converter tool has multiple new features which help to Recover and export OST file into PST, EML, MSG, office 365, and Live exchange server proficiently. Further, it also helps to recover OST files without changing items properties. Shoviv has recently added another new feature which helps to add multiple OST files at once and convert into selected file formats. OST to PST Converter tool support all MS windows Operating system Win 10, Win 8, Win7, XP and older version along with MS Outlook 2016, 2013, 2010, 2007 and older versions. 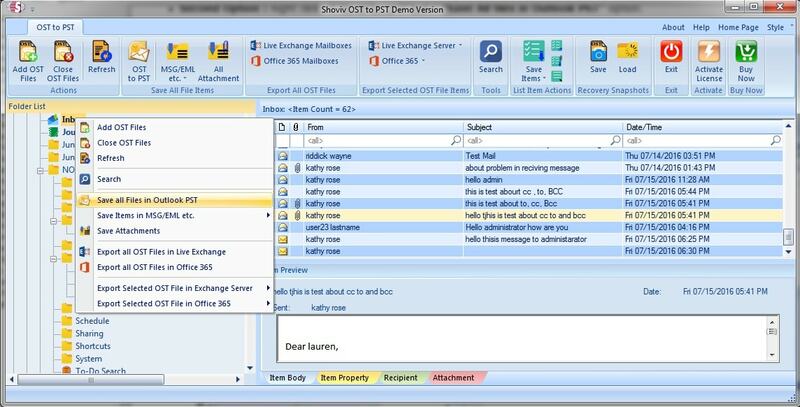 Users can download OST to PST Converter tool trial version to know its working functions and features. Trial version allows converting first 25 items per folder from OST to PST format. If users want to convert OST to PST files in large number, they can go with full license version of OST to PST converter software. For more query, you may contact us any time using our chat room, email address, or toll free number. We will be happy to help you. DeskLauncher is a desktop utility that provides an alternative method of launching applications, easier to use than Windows Start menu, and neater than having large numbers of desktop shortcuts. Best tool to repair corrupted SQL server backup file (.bak) and export recovered data items to the SQL Server database.